Those of us who remember the 1980s and the early days of console gaming can probably recall at one point or another being puzzled by the text we saw appearing in white block letters on the screen before us. 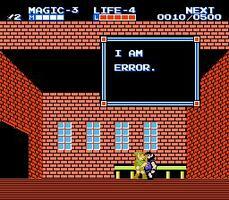 Zelda II: The Adventure of Link had one of these classic moments. You, the hapless player, send Link into a house to gather information, and the NPC, with perfect aplomb, announces that, “I AM ERROR.” To which most players responded, “I am confused.” If you never got to experience this, one of the high points in the history of gaming localizations, I have procured for you a shiny screenshot. Behold! The fellow’s name would better have been romanized as “Errol.” But you see, the Japanese language doesn’t distinguish between “r” and “l” as we do and you can see for yourself the results of a poor translation. Sadly, haphazard localizations did not remain a relic of the 8-bit area. Final Fantasy Tactics for the PS1, considered a breakthrough in the tactical RPG genre, had as its greatest flaw an exceedingly faulty translation, full of mistakes and grammatical errors, which tipped the balance from complex to convoluted where plot was concerned. Things did start to turn around in time, but the greatest champion for high quality localizations appeared in North American stores in 2005 in the form of Dragon Quest VIII: Journey of the Cursed King. Did I mention that they threw in a Final Fantasy XII demo disc to lure in FF fans? The president of Square Enix was actually giving an interview in which he was discussing the importance of doing a quality translation for the game. To think that the English language, and by extension the English-speaking audience, would finally get the linguistic respect it deserved — revolutionary! Square Enix didn’t stop there, though. When the game was announced for North America and PAL territories more enhancements were listed: voice overs for cut scenes, improved animations during battles, a spruced up menu system featuring colourful icons instead of white on black text, and a new fully orchestral soundtrack. In short, they went all out. 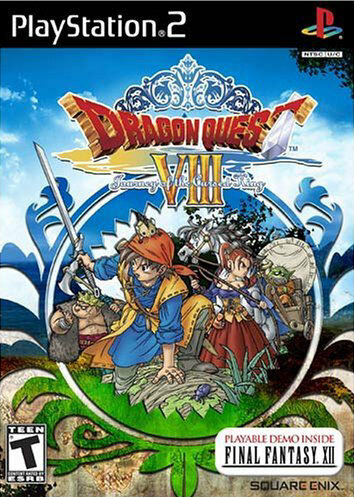 While Dragon Quest VIII didn’t sell anywhere near the numbers overseas that it did in Japan, it was a breakthrough for the series, selling some 600,000 copies in North America and another 600,000 in PAL territories. To put this in perspective, Dragon Quest VII for the PlayStation sold 200,000 copies in North America. The game was almost universally well reviewed and made a name for the Dragon Quest series on this side of the Pacific. Many game publishers are paying much closer attention to the quality of their localizations these days and Dragon Quest VIII truly stands out as an exemplar of what good localization can do for a game.